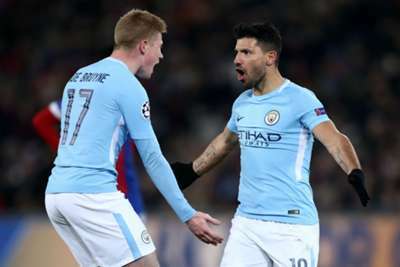 Kevin De Bruyne and Sergio Aguero returned to Manchester City's starting line-up as Pep Guardiola handed a debut to 17-year-old Eric Garcia in the EFL Cup quarter-final at Leicester City. De Bruyne was City's player of the season as they won the competition and the Premier League last time around, but a pair of medial knee ligament injuries have hampered his progress this time around. Aguero, who has not appeared since heading a late equaliser in last month's 2-2 Champions League draw at Lyon due to an abductor problem, was an unused substitute on Saturday but is back in a City side featuring a more unfamiliar face. Former Foxes favourite and Manchester City's record signing Riyad Mahrez is in the visitors' forward line alongside Aguero and Brahim Diaz.